Percy Mitchell. The American Relief Clearing House. 1922. Chapters 7-9. Last night I drew up mine account. Thy mercy-seat I'll lay before. "Send anything. We can use everything." So runs one of the pithy appeals of the A.R.C.H. It was productive. From all parts of the United States, from the Philippine Islands and Hawaii, from so far afield as Japan and the Sandwich Islands, came "everything." In the gifts, diversity of source was equalled only by diversity of species. A "Museum of Human Industries" could be formed with a specimen of the different articles received. The most ingenious and touching ways of helping the cause were devised. A resident of Los Angeles gave the sum produced by the sale of a poultry farm which she sold to raise funds "for the French." To a pair of knitted socks were pinned two one-dollar notes "for the French." At Christmas, 1915, an American couple sent two cheques which they had presented to each other as a gift "for the French." A friend of France sent $500 to be distributed "at the Front or on the field of action." A sympathizer with Belgium appealed to the A.R.C.H. to help by pointing out to him a small Belgian orphanage in need of funds. Rev. Dr. Watson found one of sixty children and the correspondent undertook to pay for its upkeep during the war. Farming implements were sent, notably through the Farmers' Club of New York. Cases of surgical and dental instruments were supplied through the Physicians, Surgeons, and Dentists Fund, an organization which rendered invaluable service to ambulances at the front. There, the stock was never too great. The instruments were in constant use and wore out with awesome rapidity. It should be noted, too, that "everything" did not mean "any old thing." The gifts, as a whole, were of excellent quality. Some --- for example, many ball dresses of rich materials --- were, in a sense, too good. They could not be distributed like other clothing to the first refugee in rags. But the A.R.C.H. did literally "use everything." The embroidered silk and satin gowns, deftly modified, brought joy to the heart of gentlewomen ruined by the war and compelled at an hour's notice to begin or re-begin the struggle for existence as governesses or nursemaids, by teaching languages, drawing, or music, by appearing in the theatre or on the concert platform, when an engagement offered. That was seldom: among the most pitiable victims of the war were members of the artistic professions." "Everything" could be used, and was used. A gift comprised trousers with one leg. Alas! There was no lack of amputated soldiers to whom such trousers filled every requirement. Some shoe manufacturers sent their unsold stocks, and a quantity of samples, one shoe of a pair. To distribute the latter was, also, not difficult. Even material not intended as a gift proved serviceable. A comprehensive collection of specimens of wood was forwarded to the A.R.C.H. with a cool request that it be passed on to French representatives of Canadian timber merchants. The wood burned joyously and was greatly appreciated at one moment of the winter when coal was very scarce and very dear. That was not the only attempt made to profit illicitly through the A.R.C.H. A case consigned to it for Nice was found to contain the outfit of a professional boxer --- his gloves, training apparatus, wardrobe, cups, photographs, posters and other "publicity" material. A huge case contained merchandise for sale, with a little condensed milk for distribution. On the plea that the few cans of milk were a charitable "offering," free transportation for the whole shipment was expected. The Customs department was ever on the alert ; and the A.R.C.H. as a matter of honour, had to be inflexible in dealing with any effort to utilize its privileged position for commercial purposes. It was realized what complications may be created by administrative formalities in a country of ancient traditions like France when, in May, 1915, 388 cases of canned food arrived at the Batignolles Station. The material could enter France duty free, but could not enter Paris without paying 8,000 frs. for "octroi," the municipal tax on foodstuffs, etc. The city authorities could not grant exemption, that being explicitly prohibited by "Article 105 of the Royal Ordinance of December 1814." The Minister of the Interior intervened with representations to the Prefecture de la Seine. But the Prefect himself was powerless. The law applies to all alike, and could not be overridden even in the name of charity. But, though it is forbidden to break the law, it is always permissible to get round the law. The matter was settled by treating the cases as "in transit." They were forwarded to the provinces for distribution among refugees in towns where the "octroi" does not exist. "When a man travels in France," said Voltaire, "he changes laws as often as he changes horses." The disappearance of the mailcoach and the centralization of government have greatly altered conditions since Voltaire's time ; but municipal institutions still display diversity --- almost as great as the diversity of State laws in America. What is prohibited in Paris may be quite licit in Fouilly-les-Oies, just as a divorce unobtainable in New York may be procured easily at Reno. The Customs franchise, at first limited to material given outright to the A.R.C.H. was soon extended to cover material consigned to it for clearance. But tobacco, alcohol, matches, and playing-cards, being State monopolies of importance in the French Budget, were excluded, and that created difficulties occasionally. Some parcels were found to contain packs of cards. As a consequence the shipment was denied entry. Finally the cards were sent to French prisoners of war in Germany. Some packages imported through the Ivry Station contained tobacco. Further controversy. The prohibited weed was handed to the Minister of War for soldiers at the front : and once more cordial relations were established between the Customs; and the A.R.C.H. Twenty cases of chloroform were detained at the Batignolles Station from March, 1915, to May, on account of the alcohol in the chloroform. A consignment of 437 cases received through Bordeaux was held at the Paris-Orleans Station because it included both tobacco and chloroform. Such incidents were numerous. But in the main they arose not from any desire to profit personally by the A.R.C.H. ; but from indifference as regards the regulations governing relief shipments. Generous sympathy caused many donors to add a few pounds of tobacco to their package, or some packs of playing-cards, or two or three bottles of something more comforting than grape-juice. Or, from a desire to send as much of "everything" as possible, they packed great quantities of supplies in huge wooden cases. Probably they never even glanced at the A.R.C.H, warning that certain articles were not to be sent in any circumstances, or at the counsel to limit the size and weight of consignments in order to facilitate transportation and handling. All that the generous donors thought of was the war ; all they desired to do was to show their sympathy for its victims. That humane impulse more than excuses every little error of commission or omission. The books in which the gifts are registered in the order of their reception are singularly eloquent. "Everything" was contributed and nearly "everyone" seems to have contributed. Some inscriptions recur periodically. Thus: "Five Brooklyn Friends" gave $5,000 every fortnight from August, 1916, to December, and empowered the A.R.C.H. to call upon them for help in any sudden crisis. This group is a landmark in the list of donors and collaborators. The November "BULLETIN," 1916, outlines its record. "For months, 'Five Brooklyn Friends' have been giving and are continuing to give on a generous scale and in an intelligent manner that is an inspiration to others. Is the need for cotton, this group sends a hundred bales ; is it for socks, the response comes with ten thousand pairs. An appeal for ambulance is made and the 'Five Brooklyn Friends' send three White ambulances, fully equipped. When the word goes forth that there is need for rubber ring cushions or hospital garments or rubber surgical gloves, these supplies come in case lots. Mention was made of a need for funds for special individual relief and $1,000 came at once. "All this giving comes through the American Red Cross which is kept in touch with the special needs of France. "Latter part of July : 'Five thousand dollars available from 'Five Brooklyn Friends ' on August first and sixteenth, September first and sixteenth. Cable needs each two weeks. "Again we received by letter on October 1st: 'Again, Five Brooklyn Friends offer $5,000 October 1st, $5,000 October 15th, $5,000 November 1st and $5,000 November 15th.'" Are not the 'Five Brooklyn Friends' doing all the Good Samaritan of ancient story did? Finding the suffering they transport them to hospital in ambulances ; they pour oil and wine upon their wounds and bind them up. When the sick and weak, stripped of their all, step forth once more, healed, they clothe them and through us speak the necessary words which give the finishing touch to the rich outpouring of their spirit. Is there anything finer in all history than the unselflsh giving of goods and sympathy to those in need? Washington told us that we owed a debt of unforgettable gratitude to France for the aid which she rendered us in our hour of need. Are not these 'Five Brooklyn Friends' carrying out his legacy to us? A few figures will reveal the development of the spirit of generosity. Let us begin with cash contributions. In the first year of its existence, the money sent --- exclusive of the "clearing accounts" which were merely a bookkeeping entry --- amounted to 981,510 frs. 31. By June 30th, 1916, the total had increased to 2475,023 frs. 19 ; at the end of the year to 3,584,512 frs. 88 ; and when the American Red Cross took over the work of relief in June1917, the cash transactions had reached the sum of 6,191,529 frs. 51. As regards aid in goods, the A.R.C.H. handled 90% of all the American relief supplies sent to France, exclusive of those shipped direct to the French Secours National. The work of " clearance " for many organizations was tremendous. It is not possible in this short record to give details even of the principal. 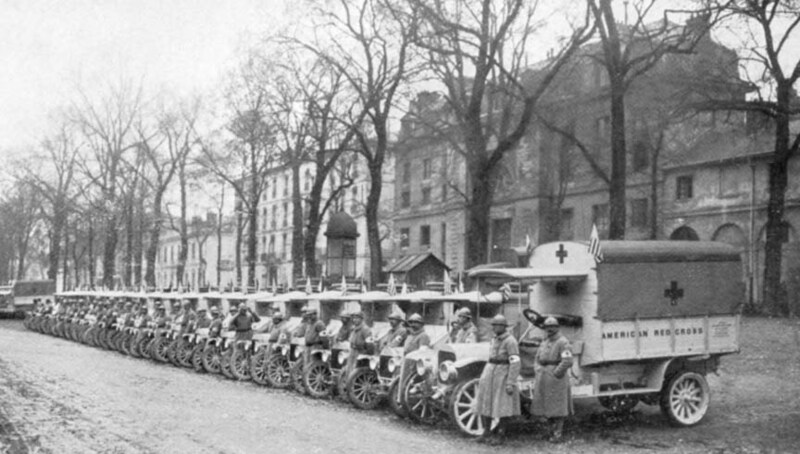 Immense quantities of goods were shipped through the CLEARING HOUSE to the American Ambulance, established in the Lycée Pasteur, Neuilly, by the Board of Governors of the American Hospital, and financed by Americans in Paris; to the American Fund for French Wounded ; to the Paris section of the Surgical Dressings Committee; to the American War Relief (Duryea) Committee ; to the manifold and admirable war charities --- "Hostels for Refugees" the "Children of Flanders," etc. --- founded and administered by Mrs. Edith Wharton. Scores of thousands of "kits" shipped by the Lafayette Fund were distributed by A.R.C.H. members among troops in the fighting line. This committee was founded in New York to mitigate the hardships endured by the French in the trenches, as a token of American gratitude for the help given by Lafayette and France in the War of Independence. The founders were : Mrs. John Jacob Astor ; Mrs. W. Astor Chanler; Mrs. John Jay Chapman; Mr. and Mrs. Archer M. Huntington; Miss Janet Scudder; Mrs. Lee Thomas; Mrs. M. Orme Wilson; Mrs. Henry Rodgers Winthrop; Miss Emily. Sloane; Mrs. Robert L. Bacon; Mr. Frederic R. Coudert ; Mr. Rawlins Cottonet ; Mr. R. Bayard Cutting ; Mr. Richard Harding Davis; Mr. Philip W. Livermore; Colonel Philip M. Lydig ; Mr. John G. Milburn; Mr. W. Forbes Morgan ; Mr. Gouverneur Morris ; Mr. Charles D. Wetmore ; and Mr. Ralph J. Preston, a name that, during the war, was always found on any list of workers in the cause of humanity and justice. "General Nivelle, commanding the II Army (Verdun) is happy to add the expression of his gratitude and thanks to those of the General commanding the Second Army Corps---and those of his gallant soldiers. " "General Pétain, commanding the group of Armies of the Centre, forwards his most sincere thanks to the generous donors in the Lafayette committee. By their delicate kindness towards the Verdun troops they have shown their sympathy with France who is now fighting for the Liberty and Rights of the European peoples just as she formerly fought for the freedom and liberty of the United States. "I have the honour to send you my very sincere thanks for the 'Lafayette kits' which your committee has been kind enough to supply to our gallant men. They have been given out to those who particularly distinguished themselves in the fighting before Verdun from August to September (1916). In conformity with the desire of the donors the 'kits' were distributed intact and gave the keenest pleasure to the happy beneficiaries thanks to the judicious choice of useful and attractive articles contained in the 'kits. ' I shall feel grateful if you will kindly transmit my thanks to the members of the Lafayette committee and assure them how convinced I am that their delicate initiative can only result in a further strengthening of the bonds of friendship that already link together our two Republics. The first six months of 1915 showed a reception of consignments averaging 1666 cases a month. At the end of the year, 22,299 had been received, a monthly average of 2549 for the last half of the year. That total for the twelve months was surpassed in the first half of 1916, the number of cases received from January 1st to June 30th being 23,124, or an average of 3869 a month. The American Red Cross alone, in March, shipped goods of a value of $23,000. At the end of 1916, the total of cases received had nearly attained 100,000, and when the books were closed the account stood at 194,431 cases. August, 1916, was a month of sensational activity in American relief work. THE WAR RELIEF CLEARING HOUSE was receiving material in New York faster than the Compagnie Générale Transatlantique could remove it, although, to utilize every cubic foot of space, bales for the A.R.C.H. were stowed in the unoccupied cabins. Passengers were few in those catastrophic days! On the 8th of the month, 3,800 cases were crossing the ocean, and 2,500 were awaiting a ship. On the 18th, the Director-General reported that the CLEARING HOUSE had received 2,331 cases in the preceding six days, and had sent out 2,969 cases. On the 29th the weekly report was : 2,050 cases received ; 2,594 forwarded. The A.R.C.H. records, by the way, usually show a greater number of cases sent out than the number received ; the difference is due to the parcels of purchased goods distributed in addition to these received direct from the United States. To sum up : beginning with 49 cases of relief material in the first month, the A.R.C.H. in its two and one-half years of existence received an average of 6,272 cases each month. The distribution records of the CLEARING HOUSE are not less instructive than the contributions records. The cash given out in France, amounts to 5,272,071 frs. 25. Of this sum 1,418,678 frs. 87 represent donations to relief societies ; 1,446,916 frs. 15 were spent for clothing and underclothing ; 556,094 frs. 50 for beds, bedding and household linen ; 108,276 frs. 70 for boots and shoes ; 108,849 frs. 10 for food, milk and fuel ; 574,479 frs. 85 for hospital supplies ; 213,455 frs. 15 for artificial limbs. The Serbians received through the A. R. C. H. 548,163 frs36; the Belgians : 175,506 frs, 45 (it should be remembered that the succour of Belgium was in the able hands of the Hoover Commission, hence the comparatively small amount contributed through the A.R.C. H.), and the Poles : 138,226 frs. 84. There is no lack of variety in the material aid given. Ten cows figure among the gifts to Dr. Depage's hospital at La Panne, the glorious patch of territory which, during the whole war, remained uninvaded to represent Belgium, free and indomitable. Two pigs are tabulated in the list of aid to Noyon. The appropriation of funds for relief in that district are terribly significant: "816 frs. to purchase knives and forks;" "37,435 frs. to purchase clothes and other supplies;" "30,030 frs. 50, to purchase fowls and rabbits." On March 29th, 1917, an appropriation was voted of 80,000 frs. for the purchase of clothes and boots to be sent to the Prefect of the Somme ; on April 10th, a further sum of 100,000 frs. was necessary, and on April 24th, still another appropriation of 75,000 frs. was voted. To re-start existence in four liberated village "12 shimmers, 30 coppers, 7 milk-churns, 10 incubators, 1 fowlhouse, and 1 rabbit hutch" were bought in May 1917. "300 frs, to purchase paper vests," is one hospital entry ---newspapers in those days were both reading matter and raiment --- "300 frs. to purchase feeding-bottles for babies," is another in the lists of relief for civilians repatriated after the Babylonian, that is, Germanic captivity. A typical bundle sent to combatant units comprised : "800 suits of underclothing ; 900 pairs of socks ; 350 mufflers 250 pairs of gloves; 50 chest protectors; 15 kilos of wool, and the inevitable bale of "absorbent cotton." 250 frs. : to purchase instruments for Infirmerie de la Gare, Dôle. 620 frs. : to purchase instruments for Hôpital auxiliaire 250, Juvisy-sur-Orge. 75 frs. : to purchase 8 rubber gloves (Chaput) for Ambulance 10/3. 75 frs. : to purchase games for Hôp. Aux. 109, Sèvres. 450 frs. : to purchase Carrel apparatus for Hôp. Mixte, Laval. 50frs. : to purchase games for Hôp. Bénévole, 46 bis, Lion-sur-Mer (Calvados). 150 frs. : to purchase instruments for Hôp. Comp. 58, Fontainebleau. 275 frs. : to purchase instruments for Evacuation Hospital 32. Amount sufficient to hire 1 hanging bed for Hôp. Aux. 233, Neuilly-sur-Seine. 250 frs. : to purchase instruments for Hôp. 37, Laval (Mayenne). 350 frs. : to purchase instruments for Hôp. Aux. 47, Lyons. 200 frs. : to purchase 60 pillows for Hôp. Aux. 202, Lagny. 100 frs. : to purchase games for Hôp. 72. 400 frs. : to purchase drugs for Hôp. de Royallieu, Compiègne. 600 frs. : to purchase instruments and drugs for Hôp. Aux. 3, Périgueux. 1,500 frs. : to purchase instruments and pillows for Ambulance 360. 30 frs. : to purchase instruments for Ambulance Automobile 6. 75 frs. : to purchase I trousse d'infirmière for Hôp. Comp. 41, St. Dizier. 75 frs. : to purchase instruments for Hôp. Aux. 40, Bordeaux. 125 frs. : to purchase instruments for Hôp. Mixte, Hazebrouck. 500 frs. : to purchase drugs, plus amount sufficient to purchase instruments, for Hôp. Mixte, Salins. 500 frs. : to purchase instruments for Hôp. d'Evacuation 37. Amount sufficient to purchase instruments for Hôp. Evac. 1, Bouy (Marne). 3,500 frs. : to purchase instruments for Ambulance 7/2. Amount sufficient to purchase artificial arm "Cauet ", for Serg. P. C.
Amount sufficient to purchase artificial leg, "Palco", for M. L. I. 72 Inf. Reg. Amount sufficient to purchase two art. legs, "Palco", for M. P. Le B. 26 Infantry. Amount sufficient to purchase art. leg.. "Palco", for M. A. L. 46 Inf. Amount sufficient to purchase art. leg, "Frees-Clarke". for M. P. G. 132 Inf. Amount sufficient to purchase art. leg, "Palco", for M. D. D. 143 Inf. Amount sufficient to purchase art. leg., "Frees-Clarke". for M. F. C. 6 Colonial Reg. Amount sufficient to purchase art. leg, "Palco", for M. V. L. 103 Artillery Reg. Amount sufficient to purchase drugs for Comp. d'Ouvriers d'Aviation, Paimbuf. 2,500 frs. : for uvre de St. Nicolas, Paris. 200 frs. : for uvre d'Education Maternelle, Chaumont-sur-Vexin. 1,000 frs. : for Restaurant du Soldat, Paris. 250 frs. : to purchase sewing-machine for Mme. M. L. Rambouillet. 10,000 frs. : : for La Mutuelle des Veuves, Paris. Voted to buy 1, 140 cases of Farine Lactée. Or a total disbursement in one day of 83,920 frs., exclusive of the cost of artificial limbs. Mr. Harjes was well inspired when in outlining, before the newly-born Allies Committee, the task of the CLEARING HOUSE, he remarked that its work among civilians would be greater than its work among soldiers and "would be needed long after the war ended." in the presence of M. Justin Godart, French Under-Secretary of State and H. E. M. Milenko Vesnitch, Serbian Minister to France. L'Europe fut un champ de massacre et d'horreur. While France was the centre of attention, her Allies were not ignored. The books of the CLEARING HOUSE record sustained efforts to help all of them within the limits of practicability. Obviously, difficult though the undertaking might be, it was easier to relieve distress in France, than in, say, Russo-Poland, or Serbia. In the latter instance, the transport problem alone was well nigh insoluble. But that circumstance served only to stimulate the charitable ardour of the A.R.C.H. workers. The more formidable the task, the greater their determination to cope with it. This is best seen in a spirited attempt to help the Serbians after their tragic exodus to the Albanian coast in the winter of 1915-16. It was not the first attempt. One of the earliest shipments made by the A.R.C.H. was composed of medicinal supplies, from English friends, sent to Miss Mary Gladwin, of the American Red Cross unit in Nish. On December 30th, 1914, a further consignment was taken out to Serbia by Drs. Cook and Cookingham. The CLEARING HOUSE also helped, with cash for the purchase of beds and with bales of underclothing, the campaign against the epidemic of typhus which literally decimated the Serbians after their sweeping victories over Austria-Hungary in 1914. The needs of Serbia at that time were enormous. England, France, and Russia organized medical and sanitary missions, The American Red Cross sent one, headed by Dr. Richard P. Strong, a specialist of international repute in tropical diseases. Another was despatched by The Urgent Fund for Serbian Wounded, an association of Americans in Paris founded by Mrs. A. M. Thackara, wife of the American Consul-General in France. The magnitude of the work of stamping out the epidemic may be gauged by the fact that the cost of the preliminary indispensable measures was estimated at £500,000. Mr. Vesnitch appealed for 1,500,000 shirts. The Honorary Secretary of The Urgent Fund, Mr. F. Warrington Dawson, a gifted writer and a novelist of great originality and power, appealed for 50,000 beds and did everything possible to interest the world in the work of rescue. Dr. Strong appealed for great supplies of underclothing. The task was too big to be accomplished by any individual association. Even the Allied Governments, energetically helped by American benevolence, found that it called for all their resources. But it was almost child's play beside the one that was sprung in the closing months of the year by the military catastrophe in Serbia. America did all that was possible to help in the work of rescue. To mention only the A.R.C.H ; it took up the question of practical relief in the first days of November when there still remained a faint hope that a miracle might happen to save the Serbians. And from that moment, to the time the survivors of one of the most harrowing tragedies in history were in security, relief for Serbia was the subject to which the A.R.C.H. gave closest attention. The first detailed reference to it in the archives is dated November 12th. A week later the military collapse of Serbia was complete and irremediable. The remnant of the army, in bitter weather, almost foodless, but doggedly choosing death in preference to captivity, was struggling through the Albanian Alps towards the Adriatic --- and towards immortality beside Leonidas and his Lacedæmonians at the Thermopylae, beside Léman and his Belgians at Liége. About the one definite point in the vague, often contradictory, reports was that food and clothing were imperatively needed. An appeal to America was cabled through THE WAR RELIEF CLEARING HOUSE, and the National Committee of Mercy. It may be said at once that America responded whole-heartedly. The A.R.C.H. alone received more than 500,000 francs ; and the Serbian Consul in New York, Professor Pupin, cabled to Mr. Vesnitch that relief material was being contributed in enormous quantities and asking where to direct it. Discussion of that point established the advisability of sending a neutral observer to study conditions in Albania and Montenegro where refugees were gathering ; and of arranging an independent service of transport. The first condition was met by the appointment of a Commission composed of Mr. Charles Carroll, whose magnificent labours, in behalf of France and her Allies throughout the war earned for him both the Legion of Honour and the Italian and Serbian medals for Military Valour; Mr. Hugh Reid Griffin, and Dr. Edward M. Ryan, of the American Red Cross. The latter knew the ground and the people, having served under Dr. Strong in the hospital at Belgrade during the fight against typhus. It was arranged briefly speaking, that the Commission should go to Brindisi, thence to Durazzo and San Giovanni di Medua. On the way to Brindisi it would call at Rome to confer with another American Relief Clearing House, a separate institution working in Italy with the active support of the American Ambassador, Mr. Thomas Nelson Page. The question of transport was met by a decision to charter a steamer. Mr. Charles Butler, of New York, an architect, and a hard-working member of the A.R.C.H. committees, promptly volunteered to go with the material and distribute it. To appreciate fully the stoicism of the offer, it should be remembered that Austria refused blandly to authorize the passage of ships. The Adriatic was mined. Submarines were doing their best to prevent food from reaching the Serbians. Their efforts were not fruitless : at the time the A.R.C.H. was organizing its expedition. to the Albanian coast a steamer with a cargo of foodstuffs struck a mine and sank at the entrance to San Giovanni di Medua. Several vessels were sunk in Durazzo harbour. In short, the role of maritime Good Samaritan involved a certain amount of risk. Mr. Carroll and Dr. Ryan left Paris towards the end of December --- Mr. Griffin going to Rome later --- and while Mr. Carroll was finding out what supplies were purchasable in Brindisi, and trying to charter a small steamer, Dr. Ryan crossed to Albania. At Durazzo he bought a few tons of flour brought there by an American schooner, the Albania, which had been ordered by the local authorities to leave those waters. Flour, however, was not, in the circumstances, an ideal relief supply, as fuel was lacking ; thus bread could not be baked in sufficient quantity for the crowd of refugees, a crowd that grew bigger through the daily arrival of groups of stragglers and refugees. It was plain that biscuit would be more immediately useful than flour ; but biscuit was not plentiful, Even had it been procurable in Brindisi, the difficulty of getting it to the coast of Albania had still to be overcome. Ships were few ; and to navigate in the Adriatic without a convoy was pure gambling. To demand from Austria an unmolested passage for an American vessel laden with relief material for a suffering people in migration was obviously out of the question. The request would have been refused without the shadow of a doubt. Furthermore, the United States could never stoop to ask as a favour that which was the right of a neutral state. And American relations with Austria were particularly strained at that moment as a consequence of the sinking of the Ancona. Finally, as the matter of transport could not be arranged at Brindisi, Mr. Carroll returned, passing through Rome on the way to discuss the point with the Italian Cabinet. And negotiations were taken up in Paris. They resulted in the chartering of the Menhir. a steamer of 255 tons, then at Oran. Trouble with the boilers and insurance formalities, however, prevented her immediate departure though every moment was precious. Nothing could be more tragic than the discussions at the CLEARING HOUSE meetings of the pressing needs of Serbia. Mr. Vesnitch made heartrending appeals for immediate aid and pleaded for an effort to be made to save the children estimated at about 20,000. They were dying by scores, dying of hunger, of exposure, of exhaustion caused by the fearful journey across the snow-covered mountains of Albania. A description of those who were finally evacuated says : "There was nothing to show that they were human except their eyes. " Every day that passed added to the number of the dead; and weeks elapsed while, owing to transport shortage and the state of war, little could be done. The vessel left Oran for Brindisi on February 3rd. But the Italian Navy, under the command of the Duca degli Abruzzi, was very much on the alert to prevent any would-be blockade runners from entering the Adriatic. The Menhir was stopped at Messina and ordered to Gallipoli, in the Gulf of Taranto. Thence she was sent to Corfu and from there to the Piræus to fetch about 300 tons of relief material which the American Red Cross, about two months earlier, had shipped to Greece for Serbia, The Menhir left part of those supplies in Corfu and another part in Corsica which also had become a haven of refuge and recuperation for Serbians. In the meantime the Allied Navies, assisted by ships which the British Societies of Friends had chartered, had been transporting the refugees from the coast of Albania. The work was finished by the end of February. The Menhir's charter expired on March 29th, and the A.R.C.H. maritime expedition closed. Mr. Butler's notes shall fill in the foregoing outline. The mission was under the ægis of the American Red Cross, and at the end of January Mr. Butler joined Mr. Griffin and Dr. Ryan in Rome. After consultation with the Italian naval authorities, who gave a special permission for the Menhir to enter the war port of Brindisi, Mr. Butler and Dr. Ryan proceeded there and remained until February 11th waiting for the boat to arrive. "While there, " runs Mr. Butler's report, Major Jost de Stael, head of the French Mission, turned over to us three car-loads (65 cases) of supplies of the Comité Franco-Serbe, mostly clothing for women and children, which had been in Brindisi for some weeks. Here, too, we found Mr. Tripcovitch, a Serbo-American, of the American Red Cross, who worked with us from this time on. "When it became apparent that the Italians would not allow the 'Menhir ' to enter the port of Brindisi we called on them to transport us without delay to Corfu, and Dr. Ryan and I were sent via Avlona, while Mr. Tripcovitch accompanied Mr. Slavko Grouitch directly to Corfu. "One of the most interesting episodes of this expedition was our journey from Brindisi to Corfu. We crossed the Adriatic in a small passenger boat, the only others to make the trip being Mr. Magoon, of the American Red Cross, who was in pursuit of Red Cross supplies which he finally found on a freighter in Avlona Harbour and accompanied to their destination in Corfu, and an English Engineer officer on a tour of inspection of the jetty being built at Avlona by the English Engineer corps. As soon as we left Brindisi it became apparent that the danger from submarines would be slight on account of the very rough weather, and the trip was made without incident. We lay for twenty-four hours in the great harbour of Avlona, surrounded by snow-covered mountains, and were then transhipped to a large Italian liner on which was one of the last Serbian regiments, 2,000 strong. The men showed the effects of the terrific strain under which they had been living. Many were without their rifles, and many were without shoes, their feet being wrapped in bits of old cloth tied together with string. But they showed of what fine stuff they were made, and after seeing them it was no surprise to learn later of the feats accomplished by the Serbian troops after rest and refitting at Corfu. "Dr. Ryan's presence on board was discovered during the evening and he was greeted with enthusiasm by the Serbian officers to most of whom his services in Belgrade were familiar. The departure from Avlona next morning (Feb. 13) was over a calm sea. And as we were a prize which would have meant glory for the captain of any Austrian submarine, the precautions taken for our protection were thorough. First, the mine-sweepers came in clearing the channel, and then we went out with one destroyer to lead the way and four others doing a 'chassé-croisé' around us to protect us from harm. "We reached Corfu, where we found the 'Menhir' on February 14th, and visited the tragic Island of Vido where a number of the oldest and youngest Serbian troops were dying as the result of starvation and exhaustion (1). Called to service among the last, just as the retreat commenced, they had been isolated at Fieri, near the border of Albania, and, with the breakdown of the Commissariat, they had retreated to the coast, unable to secure supplies, and harassed at night by the Albanians --- apparently friendly by day. But the French Army medical authorities, a few days before our arrival, had taken hold and had procured from the French fleet a number of huge tents to serve as hospital wards while the Adrien 'baraques,' shipped from France, were being erected. We met the French military surgeon, Dr. Randon, who asked us for blankets which we were able later to furnish him --- about 1,000 in all. He also asked if we could get him tents, sheets, slippers, fuel-oil, and ordinary medicines. After consultation with the French medical authorities as to the best use to be made of the 'Menhir ' and the funds at our disposal, it was decided that it would be wise to proceed to Athens to purchase medical supplies, sheets, slippers, and so on, and to load about 300 tons of American Red Cross supplies, then lying in storage in the port of Piræus. They had been destined to the Serbians, but as a result of their retreat it had been impossible to deliver them and they had been discharged and placed in storage. "On February 18th, we left for the Piraeus, but were delayed by storms so that we got there only on the third day out. In Athens we purchased from funds for the Serbian relief 2,000 sheets, 700 pairs of slippers, 100 cases of fuel-oil, and varied drugs, among them, after great search, 50 lbs of castor-oil, at 6 1/2 drachmas a pound, and quinine, at 140 drachmas a pound, and aspirin, at 67 drachmas. The American Legation and Consulate staffs gave us every possible assistance. "The 'Menhir' was to leave the Piræus for Corfu on Wednesday morning, March 1st. It was decided to divide up our party. Dr. Ryan left Athens on Thursday, the 2nd, to take the Greek mail-steamer ,for Corfu, and Mr. Ralph Bates, of the American Red Cross, whom we found in Athens and who had helped in purchasing and loading supplies, and myself, left at the same time for Messina and Rome. But we were delayed by storms and only reached Rome on March 8th. While in Rome, Mr. Hugh Reid Griffin had received from the British Serbian Relief Fund, in Corsica, a request for sheets, pillow-cases and standard drugs for the civic hospital in Bastia ; so we purchased 1,000 sheets, 500 pillow-cases, and 50 lbs of castor-oil, quinine, aspirin, bismuth and bi-carbonate of soda. "Messrs. Ryan and Tripcovitch left Corfu on the 'Menhir' on March 12th, but were delayed by the usual storms. On March 16th, the ship having finally reached Naples, Mr. Griffin and I proceeded there, and on the following day, Messrs. Ryan and Tripcovitch, and I left on the same vessel for Bastia where we arrived on the 19th. We visited, with the Serbian representatives, the various barracks and found them in excellent condition. The next day we went by rail to Ajaccio where we visited, with the Prefect, who is in charge of all Serbian Relief work, four of the five establishments where the Serbian refugees are housed. "The number of sick in the hospitals at Bastia and Ajaccio was much smaller than we had expected; so the sheets and pillow-cases, with the exception of one bale given to the British hospital at Bastia, were turned over to the Prefect for distribution to women and girls as well as to the hospitals, and the drugs were sent to Ajaccio to be distributed under the supervision of the chief medical officer of the island. We also disembarked here 50 cases of condensed milk and a number of cases of clothing and boots from the Red Cross supplies --- in all about 90 cases. "The , Menhir' left Bastia in a storm on Wednesday, the 22nd, and on account of the heavy weather was three days getting to Marseilles. There we disembarked the remaining Red Cross supplies and the 'Menhir' was turned over to the owners on March 29th. "In conclusion, acknowledgment must be made of the great help given to the mission by the American diplomatic and consular representatives in Rome, Athens, Marseilles, and, in fact, in every place where we came in touch with them. The French Embassy in Rome, and the French and British Army and Navy officers, were always most courteous and helped in every way possible the efforts of the mission to carry out their task." (1) " The Island of Vido should be for ever sacred in the annals of human commiseration. On that bare rock, for weeks, battalions of Serbians were laid out, a symbol of the grave." (RENÉ MILAN). That expedition does not form the whole of the Serbian relief work in which the A.R.CH. participated. It contributed to the efforts of the CLEARING HOUSE Committee in Rome which, collaborating with an Italian Committee created by Dr. Signorelli, rendered valuable assistance to Serbian refugees who began to arrive in Rome about the beginning of January. They were, in the main, on their way to France, and of the middle class --- students, members of the liberal professions, artists, tradesmen, clerks, and some agriculturists. All bore the marks of prolonged privation and physical suffering. Those completely without money were lodged by the committee at the Salvation Army People's Hotel and a number of boarding-houses. They were given vouchers which enabled them to procure clothes, underclothing, and shoes, according to their needs, and on leaving Rome they received a small sum, viaticum, for the journey. Medical treatment was provided for the sick. Work was found for some of the refugees, and the children were sent to school. In its report on the work, the Serbian Refugees Relief Committee says: "We earnestly thank the Italian Government, THE AMERICAN RELIEF CLEARING HOUSE, and the Serbian authorities, for their assistance, contributions and co-operation." The A.R.C.H. sent to Princess Demidoff, wife of the Russian Minister in Athens, 100 beds for the Serbians who took refuge in Salonika ; 20,000 frs. were voted for the purchase of material for hospitals created in Corfu by Princesse de Poix and Comtesse H. de Reinach ; 50,000 frs. were voted to provide shelter for Serbian wounded ; grants of funds for Serbian refugees were made to the French authorities at Ajaccio, Marseilles, Nice, Draguignan, Grenoble, Gap, Aix and other centres. In all, the American cash contribution distributed for the relief of Serbia by the A.R.C.H. amounted to 548,168 frs. Montenegro, though its situation was less tragic, was not entirely neglected during the epidemic of typhus in 1916. Roumania came into the area of the A.R.C.H. work in December, 1916, when what remained of the army was being re-formed in Moldavia. About 1,500,000 of the Roumanian people., in addition to the regular population, and the army corps which Russia had sent too late to render any service to Roumania, were massed in the narrow strip of territory unoccupied by the enemy. Food and everything else was lacking. The moment the facts were known, the CLEARING HOUSE made up a shipment of various supplies including medicines to the value of 19,000 frs., and urged other societies in Paris to do likewise. The consignment was transported by the French Government to Archangel and there delivered to a special courier sent by the Queen of Roumania to take charge of the greatly needed hospital material and ensure its safe arrival at Jassy --- a happy result that did not await all the shipments sent to Roumania. Poland, overrun by both groups of the belligerents and cut off from extraneous help, also aroused the pity of the CLEARING HOUSE, which sent funds --- at one time through Mr. William S. Patten, who had gone to Petrograd --- for employment in behalf of the Poles. The relief contributed to Poland amounted to: 138,226 frs. An effort was made to help the Christian population in Lebanon ; but the Turkish authorities were obdurate, and nothing could be done except with the aid of United States warships. In February, 1916, Mr. Barbour went to Switzerland with a mass of clothing and hospital material, 36 huge cases and bales, for tuberculous French prisoners of war who had been exchanged by Germany for internment. At Montreux, Glion Chernez, Leysin and Interlaken he distributed 1,200 shirts, 1,200 suits of underclothing, 1,200 pairs of socks, 720 pairs of slippers, and 1,100 blankets. A detailed report of the mission, with photographs, statistical and other data relative to future needs, was sent to M. Justin Godart, Under-Secretary of War (Service de Santé) and called forth a letter expressing warm appreciation and thanks for the timely aid rendered by the A.R.C.H. Early in 1917, a military hospital was created in Fribourg, Switzerland. The CLEARING HOUSE contributed 25,000 frs. towards its equipment. No part of Europe, which was, in Boileau's grim and ever truthful phrase, "a field of massacre and horror," escaped the attention of the A.R.C.H. Wherever was distress, there the A.R.C.H. carried American help. "Children in my country," said Mme. Vandervelde, "kiss the Stars and Stripes." The veneration underlying the act is not confined to Belgium, thanks to the spirit which called the A.R.C.H. into being and marked all its actions, In France, also, and Italy in Serbia, Poland, Roumania ; throughout war-scarred Europe, America symbolizes sympathy and fraternal aid. In June, 1917, the American Red Cross succeeded to the glorious and onerous duties of the AMERICAN RELIEF CLEARING HOUSE. Le roi est mort! Vive le roi! The event had been under discussion for some time. It loomed up as a possibility the day the United States, faithful to the great ideals and traditions of the Republic, accepted Germany's challenge and took up arms in defence of liberty. There is a prophetic note that seems to forebode the dissolution of the A.R.C.H. in a reply of Mr. Harjes to M. Hanotaux's speech at a regular meeting of the Allies Committee. "You have had American aid," he said. "Now you are going to have the aid of America." The meeting happened to fall on April 5th, the day after the momentous vote in the United States Senate, and is unique in that it is the only meeting of the CLEARING HOUSE collaborators at which war, not charity, was the topic discussed. The decision of the United States was hailed with joy by the French, and with keen satisfaction by the Americans. It was not unexpected. On the contrary, it was awaited with such complete confidence that preparations to celebrate it had been made. At a meeting of the Executive Committee on March 29th, the minutes report demurely : "It was decided that a dinner should be given by 'Archouse'on Thursday, April 5th, WHEN IT WAS HOPED that the state of war would exist between the United States and Germany." The hope was fulfilled; and the members of the A.R.C.H. were extremely happy. They were of that grand type of neutrals who "so long as the Kaiser was smashed didn't care who smashed him." The dinner took place on April 10, at the Hôtel Ritz, and was the occasion of a great display of enthusiastic national rejoicing. Mr. H. H. Harjes presided --- the French Government that very day had created him a Knight of the Legion of Honour, and since then has promoted him Commander in the great Order --- and those present, in addition to the American Ambassador, the Hon. W. G. Sharp, and all the members of the A.R.C.H., included : M. René Viviani, Admiral Lacaze. M. Léon Bourgeois, M. Albert Thomas, M. Th. 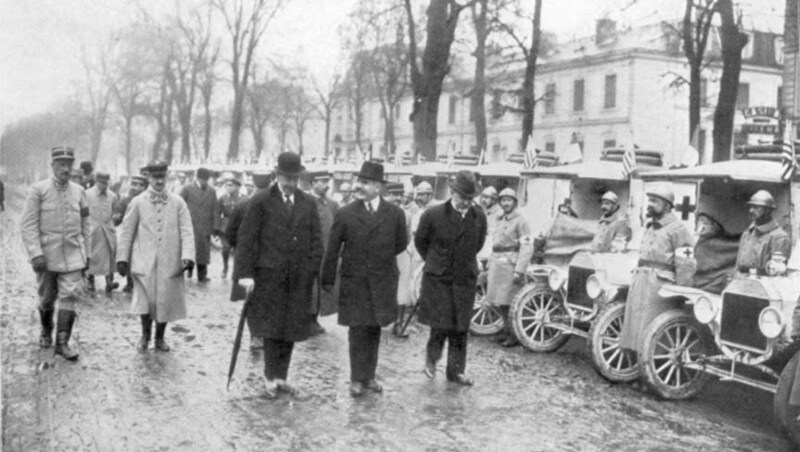 Steeg, M. Albert Métin, M. René Besnard, M. Justin Godart, representing various departments of the French Government and parliamentary activity; M. de Brocqueville, Belgian Premier and Minister of War, the British, Russian, Italian and Japanese Ambassadors ; M. Milenko Vesnitch, Serbian Minister to France; M. Lahovary, Roumanian Minister ; General Claudel, representing General Nivelle, the Commander-in-Chief of the Allied forces in France ; M. Delanney, Prefect of the Seine; M. Mithouard, President of the Paris Municipal Council; M. Paul Appell, President of the "Secours National," M. Gabriel Hanotaux, M. Henri-Robert. Mr. Harjes in an admirable, inspiriting speech, and in a tone that revealed heartfelt emotion, paid a glowing tribute to the heroism and grandeur of the French poilu and to the French nation of which the confidence in ultimate victory had never wavered; and in concluding he declared his absolute conviction that the participation of the United States meant the early overthrow of the common enemy and the triumph of Right, the supreme ideal of the Allies. M. Viviani, in an extempore speech of singular power and beauty, thanked Americans for their generous help, exercised through the A.R.C.H., and for their intervention in the cause of justice. "When, united, irrespective of race," he said, "we shall have saved democracy, we can lay the palm of justice like a precious flower upon the graves of our immortal dead." M. de Brocqueville, in the name of the Belgian martyrs thanked the United States whose entry into the war sounded the death-knell of the sanguinary theory that might is Right, the theory which Germany had been trying for nearly three years to impose on the world. M. Vesnitch spoke pathetically of invaded, mutilated Serbia and of her gratitude to France and the United States. The American Ambassador, Mr. Sharp, closed the speeches with an eloquent homage to France "who has," he said, "led the civilized world along path to victory." He dwelt on the heroism of the armies of little Belgium and Serbia, and wound up with a tribute of admiration for President Wilson's prophetic insight and his courage in leading the American people to their rightful place on the side of those who were fighting for Liberty and Justice. "Suffering humanity," he said, "is under a durable debt of gratitude to him for that inestimable service." M. Viviani brought the meeting to a close by thanking the individual speakers and proposing a toast to President Wilson, "the noble successor of Washington and Lincoln. At the meeting of the Allies Committee, to which reference has been made, there was also a great scene of patriotic enthusiasm. M. Gabriel Hanotaux voiced the gratitude of France for the entry into the war of America, the latest testimony to the justice of the French cause, and dwelt with grateful appreciation upon the services the A.R.C.H. had rendered. "You helped us greatly before your national Government took its grand decision," he said, addressing the CLEARING HOUSE committee. "You were here, with us, upholding us, binding up our wounds, relieving our distress not only with material aid but with moral encouragement. Whenever we turned to America, you responded to our appeal. We thank you from a full heart. We, the French, are proud to be your Allies, to he linked together in the same spiritual brotherhood and with the same ideals that united the new-born Republic and France in the War of Independence." Mr. Beatty and Rev. Dr. Watson replied, in the temporary absence of Mr. Harjes, who had gone to the Chamber of Deputies for the historic sitting at which America's entrance into the war was officially announced. It was upon his return from the Chamber, after describing the great demonstration he had witnessed, that Mr. Harjes made the pregnant remark referred to above : "You have had American aid, he said, "now you are going to have the aid of America. The difference was immeasurable ; and the change soon began to make itself felt. The first definite indication of the vast operations in Europe contemplated by the American Red Cross was contained in a personal message cabled to Mr. Harjes in the third week of April. It announced that relief work on a big scale was to be undertaken and asked : "How much money can you use immediately and for what purposes?" That was a promising beginning. What followed was equally promising ; for the despatch continued : "Specify detail of equipment and supplies you will require when transportation is available. Do you need men from here to add to the present organization carrying on American relief? If so, what kind." The message, though not official, clearly indicates that at first the idea of continuing the work of relief through the agency already existing, the A.R.C.H., was entertained. Another indication was the receipt of $250,000 from the Red Cross of which sum $100,000 were for the distribution work of the CLEARING HOUSE. Mr. Harjes was the delegate of the American Red Cross. The A.R.C.H. was its official representative in relief work. Furthermore, the results achieved by the Clearing House were universally extolled. Hence, many reasons militated in favour of maintaining an organization that had proved its efficiency, and could be enlarged to any extent necessary. On the other hand, with America a belligerent, measures became not only practicable, but essential, that previously were impossible. To ensure the fullest return from the available transport resources, the services, first, for the American forces in Europe, secondly for relief work in Europe, must be centralized. And centralization by the Red Cross meant the end of independence for the A.R.C.H. One thing was clear: a comprehensive programme of relief work in Europe was being drawn up in Washington. But the information received in Paris was only general until the arrival there of Major Grayson M. P. Murphy, a former cadet of West Point, an eminent financier, and the American Red Cross High Commissioner for Europe. Major Murphy, with the Assistant Commissioner, Mr. James H. Perkins, and the High Commission, composed of a number of specialists in relief work, transportation, and administration, reached Paris on June 13th. In six days he had measured up the situation,. resources, and needs, and had begun to grapple with his stupendous two-fold task ; the organization of all the Red Cross work necessary for the American armed forces, and the prosecution on an immense scale of relief work in Europe Protracted conferences were held with the Executive Committee of the A.R.C.H., to determine the most effective line on which to conduct future relief operations. Study of the matter in detail and from every point of view, brought the Commission and the CLEARING HOUSE to the conclusion that the task confronting America made a new organization, established on a military basis, essential. That new organization, created in view of the work to be done, was "The American Red Cross for France and Belgium." Major Murphy headed it, with Mr. Perkins as his Assistant. Mr. H. H. Harjes accepted appointment to the post of High Commissioner for France and Belgium, and Mr. H. O. Beatty to the post of Director-General. each department under a responsible head exercising corresponding authority. These arrangements agreed upon as imperative, it was decided that the new organization should begin operations immediately, the Paris CLEARING HOUSE to retire from further independent action in the sphere of relief work. The decision was not taken without regret., It was sad to lose personality and become merely part of a machine. But that is war: "c'est la guerre." Hitherto, the CLEARING HOUSE had been animated solely by a desire to relieve distress. That desire had now become subordinate to the determination to concentrate every energy upon the work of winning the war. So the immolation of the A.R.C.H., the child of the Committee, was accepted, if not joyously, at any rate without hesitation. A meeting of the Executive Committee was called at the Offices, 5, Rue François I, for June 19th, at six o'clock. Major Murphy attended it. The others present were : Mr. H. H. Harjes (Chairman); Mr. Walter Abbott, Mr. James R. Barbour, Mr. H. O. Beatty, Mr. J. Ridgeley Carter, Mr. Hugh R. Griffin, Mr. James H. Hyde, Mr. Randolph Mordecai, Mr. George Munroe, Mr. M. P. Peixotto, Mr. Ralph Preston, Rev. Dr. Watson; also Mr. James H. Perkins, Mr. Carl Taylor, of the Red Cross Commission, and Mr. Charles R. Scott. Major Murphy, welcomed by the Chairman, sketched the plans drawn up tentatively for the employment in European relief operations of the immense sums which were being raised in America. In behalf of the Committee, Mr. Harjes expressed the satisfaction that Major Murphy's generous views and far-sighted projects gave to the members. And, interpreting the unanimous sentiment of the Executive Committee, he put at the disposal of "The American Red Cross for France and Belgium" the entire organization of the A.R.C.H. to be used in any manner that could best serve to carry out the magnificent programme of the Red Cross. Mr. Preston, representing THE WAR RELIEF CLEARING HOUSE FOR FRANCE AND HER ALLIES, New York, said that its views coincided in every respect with those of the Red Cross and that it would support any action decided upon by the A.R.C.H. "WHEREAS, in view of the ability of the American Red Cross to obtain very large sums of money for its work., greatly in excess of the amounts obtainable for such purposes by this Corporation, and the extensive organization which the American Red Cross will have in Europe (which will include in its personnel a great majority of the persons now connected with the work of this Corporation) the Executive Committee believes that hereafter such work can be carried on and developed more effectively by the American Red Cross acting through the organization above mentioned, and that in consequence it is for the interest of France and her Allies that this Corporation now discontinue its work. First. That as soon as the Administrative Committee of this Corporation is satisfied that the American Red Cross is prepared to take up and continue the work now carried on by this Corporation, such Committee is authorized and directed to discontinue the work of this Corporation and to make the necessary arrangements with the American Red Cross for the carrying out of such work by it except as hereinafter stated. "Second. That all money and supplies held by this Corporation at the time the work of this Corporation is taken over as aforesaid by the American Red Cross, including such as have been delivered to the representatives of the Corporation in America for delivery by it to some individual committee or Society in Europe, shall continue to be disposed of by this Corporation as if these resolutions had not been adopted. "Third. That upon or prior to the taking over of the work of this Corporation, instructions shall be sent to the proper representatives of this Corporation in America to the effect that they shall notify persons who have heretofore contributed supplies of funds to this Corporation or from whom this Corporation has accepted supplies for delivery by it to other individuals, committees or societies, that this Corporation has decided to discontinue its work, and that hereafter all such contributions should be made to the American Red Cross to be disposed of as it in its discretion may determine. "Fourth. That the Director-General of this Corporation is authorized to sell or lease to, or otherwise permit the use by, the American Red Cross, of all automobiles, office furniture, office supplies, and equipment, and any other property of this Corporation useful in carrying on the work to be continued by the American Red Cross upon such terms as the Administrative Committee of this Corporation shall approve. "Fifth. That the proper officers of this Corporation are authorized and directed to give such notices, to execute such papers, and to perform such acts as they shall deem necessary or advisable in order to carry out the purpose and intent of those Resolutions. Is the document reproduced above the death certificate of the A.R.C.H? The question was raised three days later at a meeting of the Executive Committee. There was some ground for uncertainty. The resolutions declare that the Committee "is authorized and directed to discontinue the work. " Does not that signify that the CLEARING HOUSE had passed out of existence? By no means. It had merely "discontinued" its work. For how long? It is possible to lay down only a general principle covering that point. The Committee was "to make the necessary arrangements with the American Red Cross for the carrying on of such work by it." Obviously, then, the A.R.C.H. "discontinued" the work only during such time as the American Red Cross might continue it. The essential thing was that the work be carried on, if necessary. Should the Red Cross step out, the A.R.C.H. was empowered, if it saw fit, to step in. This was so decidedly the view of the Committee that on June 22nd it was declared by an unanimous vote that the resolutions of June 19th were to be so interpreted, and that "the CLEARING HOUSE would resume said work at such time when it does not interfere with the work of the American Red Cross." The CLEARING HOUSE was not to be regarded as defunct. It was in a state of "watchful waiting." It had represented the Red Cross in France for two and one-half years. America having entered the war, the Red Cross became its own representative. But while the work of relief was now being carried on under the supreme authority of the American Government --- for that, in the last resort, is what the change amounted to --- it was being carried out largely by the men who, under the insignia of the A.R.C.H. had taken American aid to so many parts of Europe. The CLEARING HOUSE had "discontinued;" but the CLEARING HOUSE men were "continuing." The personnel, or a large majority of it, enrolled in the Red Cross. For at the decisive meeting of June I 19th, Mr. James Hazen Hyde proposed, and the proposition was unanimously adopted, that the services of the members of the A.R.C.H. "as a body, should be put at the disposal of Major Murphy to the extent that each man's personal affairs would permit." "In order to make this co-operation effective, we suggest that WARELIEF notify its usual contributors of the change which has taken place in Paris and that from and after the 1st of September next, supplies and funds will" no longer be accepted for distribution or clearance. The supplies and funds in Paris will be distributed in accordance with the terms of their contribution. Except as above, further donations should be accepted by WARELIFF only upon the basis of complete discretionary distribution by the American Red Cross for France and Belgium. " "It is distinctly the intention and policy of 'The American Red Cross for France and Belgium' to protect and to guarantee a full measure of liberty to all American relief works and French societies now existing, the only condition to be required of then: being that of efficient co-operation and co-ordination of their work with theirs" (i.e. : that of the American Red Cross) "under which circumstances, aid and assistance from the resources of the new institution will be extended them under reasonable restrictions and in a measure proportionate to their needs. " Although so indisputably advisable, the merging of the A.R.C.H. into The American Red Cross for France and Belgium was a bombshell for the societies that had been working so hard to aid France and her Allies. Liberty is sweet : the relief organizations did not relish the thought of surrendering their independence to become merely a cog in a huge wheel of charity. THE WAR RELIEF CLEARING HOUSE was inundated with letters from indignant committees. Traces of the discussion are plentiful in the cablegrams exchanged between Paris and New York at this time. You state," cables "WARELIEF," that a full measure of liberty is guaranteed to all, American Relief works and French societies now existing. "Are we to understand that 'The American Fund for French Wounded,' 'The National Surgical Dressings Committee,' 'The Secours National,' and other responsible committees in the United States, will be allowed to send supplies as usual to their distributing agencies in France through the Red Cross?" Naturally, that precisely was not to be understood. Regret it as one might, relief operations in Europe could be continued only on a fresh basis. Just as the A.R.C.H. had been necessary to centralize the work in the period of neutrality, the centralization plan thought out by the American Red Cross was necessary now in the interest first of the Army, then of civilians. Supplies for relief associations had been transported with difficulty before ; with America at war they could not be transported at all except as part, a subordinate part, of the military transportation work. The whole of the available shipping was more than ever insufficient now that America was sending men and war material to France in steadily increasing numbers and volume. "5th. it is, therefore, desirable that the corresponding societies in America should, if they please, continue their identity, working for the general good and sending their donations to the Red Cross for discretionary distribution in order that at all times that organization shall be in a position of affording the greatest amount of relief not only through its own administration but through the channels through which it may elect to operate." "The work done during the first three years of the war by those Americans, both in France and America, who gave their money, time, and strength to relieve the suffering among the Allies, should be publicly acknowledged as a great example of self-sacrifice and generosity, and to the people who carried on this work all homage and thanks are due. Their work has been necessary and has been well done, and because of it the American people are in a position to continue work of that character which would have been impossible otherwise. "No new organisation coming into the field now has any right to take action which will in any way diminish the credit which is due to the existing societies and organizations, or which will in any way lessen the effectiveness of their work." But only new machinery could meet the new and enormous difficulties that had arisen as a consequence of America's entry into the war. The point was discussed fully and the Message concluded with an appeal for united co-operation with the Red Cross to " carry out the desire which all have in their heart to render the greatest possible service in the difficulties of the existing situation." "We, the undersigned, approve and endorse the above Message from the Red Cross Commission in Paris to the War Council, dated August 29th; and with our knowledge of the situation and our experience of the ground here, we recommend to our friends and fellow-workers at home the acceptance of the views and the adoption of the plan proposed in that Message. " The Recommendation was signed by: Mrs. Edith Wharton, Mrs. William H. Hills, Mrs. Edward Tuck, Mrs. William K. Vanderbilt, Dr. Joseph A. Blake, Mr. August F. Jacacci, Mr. Atherton Curtis, Mrs. E. W. Shurtleff, Mr. Walter V. R. Berry, Mrs. C. E. Austin, Mr. John Gardner Coolidge, Mrs. Benjamin G. Lathrop, Mrs. R. W. Bliss, Mr. Edward Tuck, Miss Anna Murray Vail, Mrs. Charles R. Scott, Mr. Whitney Warren, Mrs. Phillip Bérard. "Reference telegram regarding Red Cross situation sent you by representatives here, their statement was prepared after consultation with me and meets my entire approval. Red Cross Service here is being systematically organized on practical basis, and similar organizations are being brought under one control as far as possible. Conditions to be met in France this winter are serious, and organization of Red Cross as well as Y.M.C.A. must be thoroughly completed in advance. This work of the Red Cross will be for American soldiers, French soldiers, and for deserving French people who have suffered from three years of war. It involves a tremendous task and must be supported by expenditure of large sums of money. The work cannot be done without thorough organization along military lines which Red Cross officials here are rapidly perfecting. Consider Red Cross management here extremely efficient and worthy of unqualified support from you, and of our whole people. " The case could now be closed, and was closed. No demurrer was possible after that authoritative and diplomatic communiqué. It cemented a "sacred union" in the field of charity, and won whole-hearted approval for the decisions taken by the A.R.C.H. and "WARELIEF". The formal endorsement of the Allies Committee had been given long before. As a matter of courtesy, Mr. Harjes, and Mr. Whitney Warren, Vice-President of the A.R.C.H., called on M. Hanotaux, President of the Allies Committee, immediately after the meeting of June 19th, to inform him of the decisions taken and the reasons for taking them. 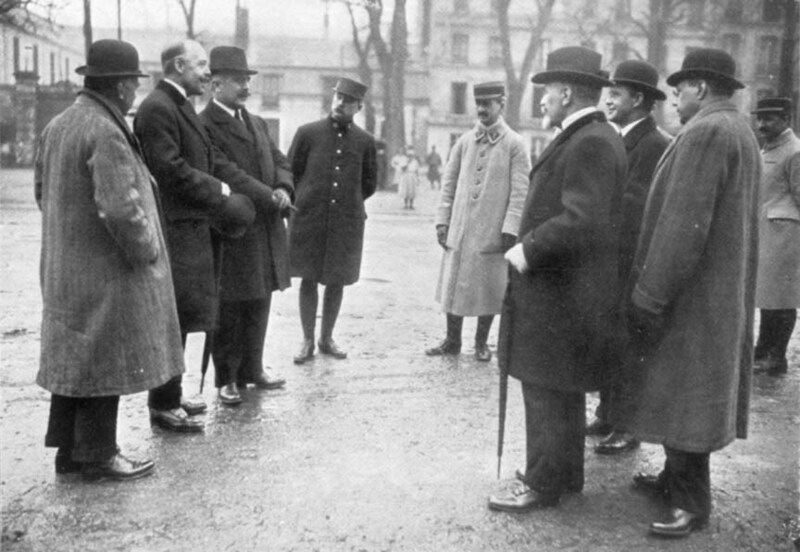 M. Hanotaux, commending the changes, suggested that a farewell meeting of the Allies Committee be called. It was held on June 28th, and attended by : M. Hanotaux (Chairman); M. G. Payelle, M. J. Branet, M. Emile Ogier, M. A. Legrand, Vicomte d'Harcourt, Captain Bugat-Pujol, M. Marraud, M. H. Ponsot, M. Rémond, M. Firmin Roz, M. Radovanovitch, M. Sevastopoulo, Prince Poggio-Suasa, M. Lahovary, Major Murphy, Mr. Perkins, Mr. Harjes, Mr. Ridgeley Carter, Mr. Charles Carroll, Rev. Dr. S. N. Watson, Mr. Hugh Reid Griffin, Mr. Whitney Warren and Mr. Randolph Mordecai. "the CLEARING HOUSE cannot disappear. It has a permanent place in history. It does not belong to itself: it has sown enduring benefits and its work has not yet reached full fruition. Its ensign is entitled to a place among those of the victors on our day of victory, for it was charity that pointed out the path to an alliance. That is why, accepting unreservedly the decisions of the American Red Cross acting under the authority of its Government, we think that the organization which had the merit of leading the way should not disappear completely. I would add that circumstances may arise for the vitality latent in the CLEARING HOUSE to show itself. For example, in the work before us, it may seem necessary to call together a group representing the different branches of the French Administration, the Red Cross and other services of the Allies. It would be difficult to find another body so competent to convene with equal rapidity, such a group to confer on any question. We have in you a reliable and recognized medium for the solution of difficulties not susceptible of being rapidly dealt with otherwise. In such circumstances the CLEARING HOUSE might still prove of service. "And now, let me add that France is infinitely indebted to you. I have not the eloquence to tell you, as forcibly as I should like, how much we owe to you, and to express the grateful sentiments that your great work has grafted in our hearts. Those sentiments are common to all of us and have been strengthened daily. There is not a single day since the foundation of your organization unmarked by some proof of your generosity and kindliness. You have built up the grandeur of the present moment. For the soldiers you have saved, for the hospitals you have helped, for the services you have rendered, our hearts say: Thanks! Mr. Harjes, in the name of the CLEARING HOUSE, thanked M, Hanotaux; and the meeting adjourned sine die. The Executive Committee met twice, on June 29th and August 24th, to settle routine details concerning the accounts, and adjourned finally "subject to the call of the Chair." But from June 20th, Mars was in command at the CLEARING HOUSE. A fortnight later, on July Fourth, the first contingent of America's armed might marched through the streets of Paris amid scenes of joy that were surpassed only by those that toward the close of the following year hailed the victory which that march-past in Paris had heralded. THE AMERICAN RELIEF CLEARING HOUSE disappeared from the stage. But it is neither dead nor forgotten. M. Hanotaux is right: it is an undying memory. It knits together in ever close union, America and France. Were that its sole achievement, even so it would deserve the most grateful thanks of mankind. But it achieved more, much more. The offspring of War and Compassion, it brought relief to the suffering and hope to the sorrowing. The visitor to St. Paul's is struck by the tablet to Wren, the architect, with its stately inscription : Si monumentum requiris, circumspice. "If ye seek his monument, look around!" So might one say of THE AMERICAN RELIEF CLEARING HOUSE. Its history is woven into and told by the manifold and successful efforts of a glorious phalanx of associations which succoured those in pain and want. Their work of love is its best, enduring record.